It is no secret that companies want me to buy stuff. They want to separate me from my hard-earned money at every turn. Exhibit A: we moved about a year ago from another state and wouldn’t you know it, I got a catalog yesterday in the mail, with “easy terms” and “guaranteed credit line.” Now, I haven’t ordered from this company in years, opted out of “junk mail” over a year ago, and never forwarded my address to any catalogs.So, what gives? 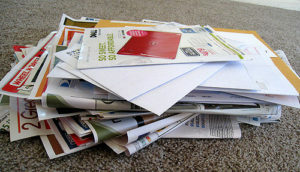 Opting out of “junk mail” is not as straightforward as it seems. There are literally four different processes to get rid of the marketing mailers, pre-approved offers, and sales calls. The Direct Marketers Association charges $2.00 to opt out for five years. Catalogs must be opted out through another process. GAAAH. I hear some of you reading this, going, “What’s the big deal? It’s just a catalog. Recycle it and quit whining.” I hear you loud and clear. But, I was very surprised by this stupid catalog, that they tracked me down to my new address out of state. I also don’t want the temptation to order on credit around because they make it easy to spend without thinking. There is always a birthday, anniversary, holiday or occasion to spend while you are budgeting and working on your debt-free walk. “I’ll pay it off next month” is way too easy to say. Problem is, if we don’t spend actual cash or shop on impulse, Murphy has a way of wreaking havoc right before the bill is due to be “paid off.” It happens almost every time. The easier a company makes it for us to spend, well, the more likely we will buy from them. There are many articles and sales books on the topic of reducing “sales friction” to help customers buy products. Amazon is continually finding creative ways to make it easier for you to buy. The latest friction reducer is the delivery to the trunk of your car. Amazon recognized customers grew wary of having packages delivered at home hours before anyone arrived to retrieve them, which created an environment ripe for thieves. Apple is another master at making buying easy and convenient for customers. In their own stores you can just “scan and go” to purchase items. For other retailers, “Apple Pay” puts purchasing at the swipe of a phone. It’s crazy. To guard against impulse shopping or spending more than you planned on a purchase, I have two suggestions to help you take control of your money. First, a written budget is a must. You are the boss of your money. You get to tell it what job each dollar is assigned each month. If you don’t have a job for every single dollar that comes in the door, it’ll just run away and spend itself on things you may regret later. The bill always shows up, whether the dollar ran off and became catalog spending on credit or putting purchases on your phone bill. Third, (although I said only two) opt out of the junk mail, sales calls, and catalogs. Block out an hour or so, make a cup of something to drink, sit down and go through the steps above. Get rid of the pre-approved credit cards and the spending opportunities that show up in your mailbox. You know, lead me not to temptation.